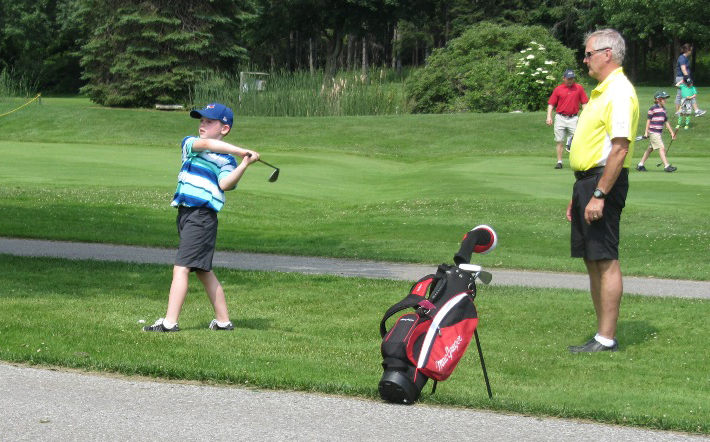 Members and guests (the public) of Peterborough Golf and Country Club have an opportunity to participate in the 2019 Junior Golf Programs. 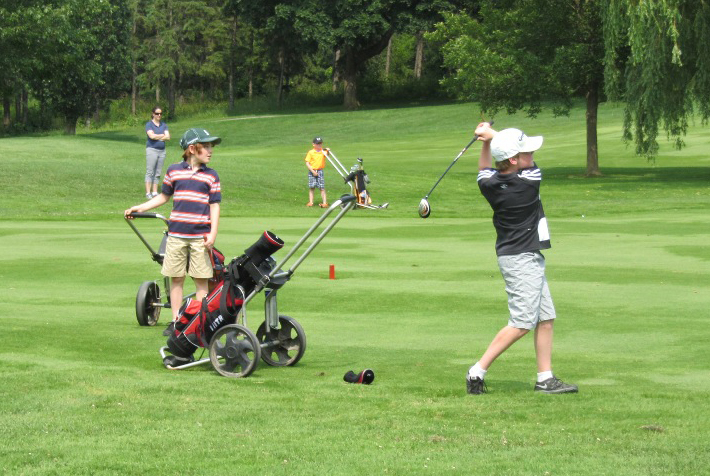 Our programs are designed to grow the game by introducing and retaining young golfers in the sport. We accomplish this through a high-quality player development program that is motivating and measurable. Lead by PGA Professional Kurtis Sweeting, and supported with both male and female instructors to provide your children with complete care. Junior and Divot Golf Members of any ability have many opportunities to develop their skills as both recreational and competitive golfers will have the opportunity for organized instruction and competition. The Divot Membership includes children 8 – 11 years old. A Qualified Junior Member wishing to play the course WITHOUT an Adult or Intermediate Member, may do so without time restriction on Mondays, Tuesdays, Thursdays, and Fridays. And may play Wednesdays after 4pm and Weekends after 11am. A Qualified Junior Member who carries a handicap index of 19.9 or less may play the course WITH an Adult or Intermediate Member playing partner(s) at any time – the Adult or Intermediate Member’s name must be included at the time of booking. Because of Rez System Category Booking Restrictions, the Golf Shop must be informed in order to add the Junior to the group. An Unqualified Junior Member may only play the course, WITH or WITHOUT an Adult or Intermediate Member, after 1pm on Mondays, Tuesdays, Thursdays, Fridays and weekends and may play Wednesdays after 4pm. This dual format event welcomes divots to play a 9 hole scramble while the format for the juniors will be a front 9 better ball and a back 9 scramble. Parents or family members and children are encouraged to participate. So bring your son or daughter, mother or father, grandparent or grandchild as the focus is definitely on FUN! Monday After School & Summer Program Included! The “no cost “Junior After School Program is open to all Junior and Divot Members who want to have fun, learn the fundamentals of the game and create friendships on the golf course! Each Monday session begins with players receiving a pre-game/post-school snack and partake in a 30-minute pre-round golf educational clinic hosted by one of our PGA of Canada Professionals before hitting the links. Program nights are listed below. Start time will be 4:30 pm each Monday during May and June with Divot Members ending at 6:30 pm and Junior aged players finishing at 7:30 pm. During July and August, we will begin at 3:30 pm. Divots will be finished by 5:30 pm while Juniors may stay and play until 6:30 pm. All players will be under Professional and Adult supervision from the time they arrive until they leave the premises. To sign up for Junior Membership, please CLICK HERE. This is a fillable form that you can complete and submit to us.